Join fellow ACBA members for the Hon. Robert B. Lee Memorial Golf Tournament and Annual Meeting. 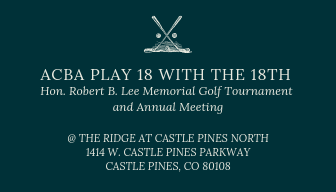 This year’s tournament will be held at The Ridge at Castle Pines North. This is a great way to network with others while enjoying an afternoon of golf, food, and drinks… on the links! Organize your own team, or sign up individually – we’ll be happy to pair you with other fun-seekers! Prizes will be given out at the Annual Meeting dinner. Following the tournament, the ACBA will hold its Annual Meeting which includes the presentation of annual awards and election of 2019-2020 officers and directors. The Arapahoe County Bar Foundation (ACBF), through its “Laptops from Lawyers” program, will present laptops to students, representing high schools in Arapahoe County, who are college-bound high school graduates. Highlight your firm’s support of the ACBA. Sponsor a hole at the golf tournament or donate a door prize and be featured in the program and next issue of NewsBriefs. Click here for PDF Registration & Sponsorship forms. We look forward to seeing you on June 14th!